I hadn’t driven the back road from Fort Vermilion to Slave Lake for perhaps ten or more years. While intention had been to cut hours from drive time, my curiosity pulled me toward what had become of Slave Lake after the town had been overcome by forest fire in May, 2011, losing a third to two thirds of its homes and businesses. I remember being five hours north and listening to radio reports of the fire moving rapidly, of the fire jumping highways, of the immediate need for evacuation of residents from Slave Lake to Athabasca and of those residents being given emergency shelter in school gymnasiums. Adele’s ‘Set Fire to the Rain’ was played by local radio stations to highlight the firefighters and water bomber pilots battling the fire and the evacuation of residents – some of the song’s lyrics associate well to the experience endured; the paradox of setting fire to rain was the attracting lyric. For me, three years on, travelling to Edmonton, along highway 88 toward Slave Lake, I found other areas of forest that had been touched in the same fire. I stopped my car for the second interruption to my drive, where the silhouette of remaining blackened, yet dead trees continue to stand somewhat vertical, in the up-and-down of pick-up-stix, against a northern Alberta sunset – their silhouette catching my eye and drawing out my camera. The first growth of flowers, cotton-like intrigued me. I walked in twenty metres on muskeg – watery, peaty, muddy, gelatinous earth that overlays earth beneath that remains frozen. These flower images were gathered. Are you now in winter? reminds me of the Tundra Cotton on Skyrim 😊 lovely! Tundra Cotton and Skyrim – both are entities to investigate; I have two friends who have moved from our area and now deal with tundra, one in Norman Wells (Northwest Territories) and one in Whitehorse (Yukon). The one in Whitehorse will go on tundra walkabout for a week at a time with nothing more than a couple packs of cigarettes and a hunting bow. The other has just sent six months supplies to Norman Wells on barge (a six week barging expedition); she’ll see them soon. 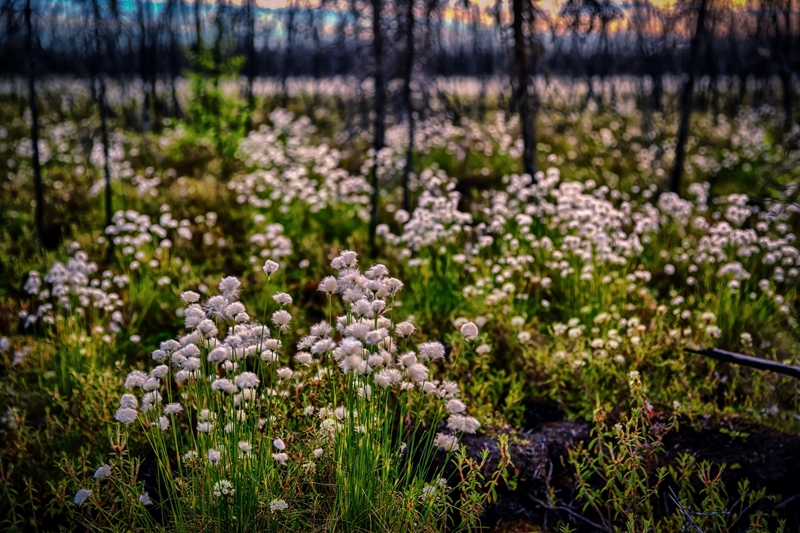 You’ll find much of Canada’s tundra in the photography of Dave Brosha – have a look … http://www.davebrosha.com . Question – Are you in the depths of winter, now? Our summer solstice (June 21 – 6:51 Eastern Daylight Time) should coincide with your winter solstice. Does it grow darker, earlier, where you are? Our sunlight differential between solstices ranges from 21 hours at summer solstice to 5 hours at winter solstice – a sixteen hour difference within six months. 🙂 i like the “couple packs of cigarettes and a hunting bow” -idea. yes, it’s chilly here now, getting dark at 6pm and light at round 7am. had snow on the high mountains recently, which was quite beautiful. no falling flakes to see tho, which is sad coz i LOVE watching and dancing in falling snowflakes. 🙂 wow, there is a huge difference in sunlight when it comes to summer and winter where you are. must be hard to adapt. Slave Lake … do you know the story behind that name? Fire is so destructive but regrowth is always reassuring that at least nature goes on. Devastating for the homes lost / lives changed. Have a read – the questions prompted more than an answer. Slave Lake – there are three entities referred to as Slave Lake: (1) the Greater Slave Lake in the Northwest Territories (largest lake in the world); (2) Lesser Slave Lake in Alberta upon which the Town of (3) Slave Lake sits in its southeastern corner. Slave Lake has history of it being a migratory path for the Dené (who speak Slavey) as their route passes through lands associated with Woodland Cree near what is now the Wabasca settlement. Slave Lake has two ideas associated with it. The first, simply, picks up on the idea that Slavey speaking Dené could be found regularly at this junction point between Cree and Dené peoples. The second, has to do with one group dominating the other and taking slaves … something more on the ‘could have happened’ side of the narrative. The Dené people (from the Northwest Territories and Northwestern Alberta) link to the Navajo people in Arizona – the same people on either side of the migratory travel route. If you watch ‘Due South’ about an RCMP constable seconded to the Chicago police force, there is a song that narrates some of the spirit of the people along this Slave Lake, Northwestern Alberta and Northwest Territories path – ‘Ride Forever,’ by Paul Gross; as I think of it, it might be a good comeback tune for you and the Harley … I’m not sure it fits entirely, but it does have a self-determined aspect on Life. 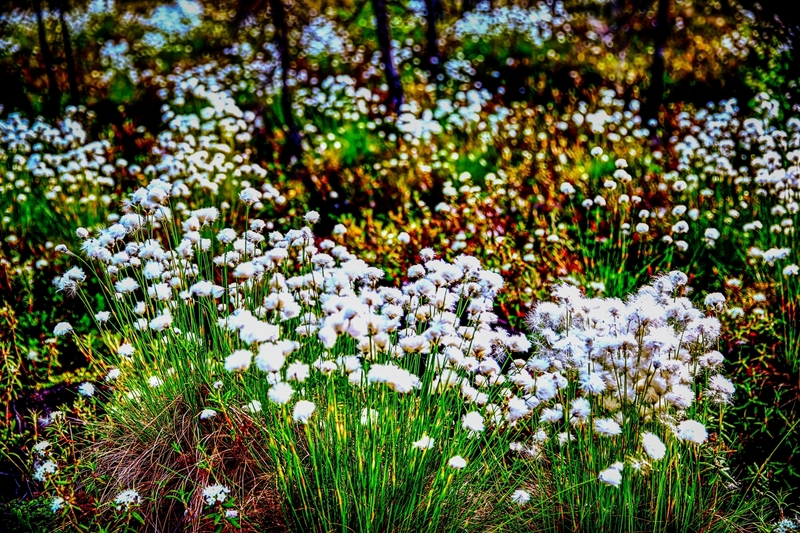 Looks like the bog cotton we get on the wild moors here, I love them in the wind, waving in the gusts and sometimes lifting into the air in flocks of white. But always marking the wetter areas, the places to be wary of. How do you get the crisp focus, do you wait for the drop in wind and get what images you can? I’ve been travelling this past few weeks, so will be catching up now. Looking at your recent posts to see what you have been up too. I’m heading off on travel too. Your comments on bog cotton signifying wetter areas holds true here. Most shots that you see in the blog are completed with a tripod and I take advantage of stillness and Live view to optically zoom in on the subject and then use manual focus at that point to find crispness/sharpness associated with subject. If I was in mountains with winds, I would put a weight on the tripod (hanging underneath from the central shaft). As with most things, it works, but it takes time to break-in the new behaviour (my learning and practice) … e.g. added steps. Saw some excellent hiking paths in your recent photos and what looked to be some good, good ale at the end of the path. Reminds of my hiking through the Lake District in 1976. Thank you … the images sort of remind me of your work. Thank you for visiting my blog, liking several posts and following. I look forward to seeing more of your work and welcome your comments when you visit my blog! Enjoy the day! It’s good to look around to see how others are seeing ‘our’ world – your blog is one that promises to provoke creative endeavor in those who interact with it. I am pleased to see that you are making photography possible for teens, helping get them started and on their way with a camera. Good, good, good! I’m a teacher and am working with another in our school to set up a media club and media studies course for our junior and senior high school students. A quarterly magazine called ‘The Growl’ (in association with our Bear mascot) has been launched. And, photos are culled into a yearbook, as well. I’ve caught myself a couple of times with typos with your name – I went to high school in Edmonton, Alberta with a Rhonda Graham. Thank you, as well, for visiting ‘In My Back Pocket – Photography.’ And, likewise, please feel free to comment on images. I also welcome discussion of photography that opens-out the issues/challenges associated with image making/gathering. Curiously, I wonder about whether you’ve got a shooting group going – a cluster of like-minded photographers that get out and about image-making? For us, up here, the opportunity of a shooting group is before me/us/others. Hmmh?